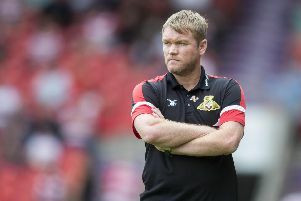 Grant McCann admitted that he got his team selection wrong after Doncaster Rovers’ 2-1 defeat at Coventry City. McCann took responsibility for what he described as a ‘chalk and cheese’ performance from his team at the Ricoh Arena. Rovers were playing catch up after a lethargic first half display left them trailing to goals from Jordy Hiwula and Luke Thomas. Joe Wright pulled one back midway through the second period and much-improved Rovers almost snatched a point at the death when John Marquis saw his shot cleared off the line. “We need to make sure the next game we play we get the team right,” said McCann. “Today I didn’t pick the right team. That’s a fact. And that’s the reason why we didn’t play well in the first half. “In the second half when we made the changes and we changed the shape a little bit we looked more of a threat. Suspended duo Andy Butler and Niall Mason were replaced by Tom Anderson and Ali Crawford, with Matty Blair filling in at right back. Rovers switched from 4-3-3 to a midfield diamond after the break. McCann then made a double change just before the hour mark when Jermaine Anderson and Paul Taylor replaced Crawford and Mallik Wilks. Taylor, whose last gasp equaliser rescued a point against Gillingham the previous weekend, again the caught the eye and is pushing for his first league start. “We had to make two changes so it does disrupt you a little bit when you’ve got two of your normal back four suspended,” said McCann. “But I thought the boys that came in [to the back four], Tom Anderson and Matty Blair, did everything that they could.